This is the new global electronic parts look-up system offering Kohler distributors and dealers easy access to thousands of parts, along with other updated features listed below. WHY IS KOHLER POWER TRANSITIONING TO A NEW SYSTEM? Kohler Power transitioned to a new platform to allow our customers to have a better aftermarket experience with current browsers and new technology. The new site offers better capabilities, better features, and easy to use navigation. 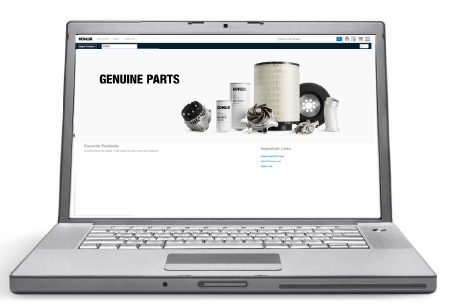 WHEN WILL www.KohlerPowerParts.com SITE BE LIVE? The site launched November 2018. WHEN WILL THE ORIGINAL www.KohlerPowerPlus.com SITE NO LONGER BE ACCESSIBLE? www.KohlerPowerPlus.com was available until December 31, 2018. Therefore, we invite you to log into the new www.KohlerPowerParts.com site and get familiar with how the system works. HOW DO I LOG INTO THE NEW SITE? WHAT IF I DON'T HAVE ACCESS? If you don't know your GN# or GD# or need additional login assistance, please e-mail generator.custcomm@kohler.com. If you are creating a new login, please allow 24 hours for your account to be activated. WHAT FEATURES DOES THE NEW LOOKUP SYSTEM OFFER?